Here is the list of the hotels near Piégut. Book your hotel near Piégut today, Thursday 09 May for the best price, reservation and cancellation free of charge thanks to our partner Booking.com, leader in on-line hotels reservation. Below here is the list the 50 closest hotels of Piégut, sortable according your criteria. You will find the position of these accommodations on the Piegut hotels map. Located in the village of Venterol, this guest house is situated in an old stable restored according to ecological specifications. It features two terraces and a garden and an on-site organic restaurant. Rooms at L'Asphodèle are cleaning decorated with tile floors and wood furnishings. The private bathrooms are equipped with a shower and toilet. Free Wi-Fi access is provided. The on-site restaurant serves organic, vegetarian meals inspired by Mediterranean and Middle Eastern Cuisine. Hiking and mountain biking are activities available from the property. L'Asphodèle also offers activites such as cooking classes and explorations of the plants of surrounding area. Guests can visit Notre-Dame du Laus Santuary 15 km away and Serre Ponçon Lake is 25 km away. Gap Train Station is 20 km away and access to motorway A51 is 10 km away. Bed and Breakfast Venterol Preferred hotel ! Set in a stone country house, La Méridienne sits right on the St-James Way, in the middle of a 2-hectare park. An outdoor swimming pool features on site, and free Wi-Fi is provided throughout the property. There is also a 5000 m² garden. Offering views of the garden or the Durance Valley, the en suite guest rooms all have carpeted floors and a wardrobe. Additional facilities include a flat-screen TV with satellite channels and an electric kettle. A restaurant serving traditional cuisine can be found on site. Guests also have access to a fridge and a microwave. La Méridienne offers free, private parking on site. You can visit Serre-Ponçon Lake, one of the largest artificial lakes in Western Europe, which is 20 km away. Many hiking paths and biking trails to discover the area are available in the neighborhood. Guest accommodation Jarjayes Preferred hotel ! Offering a garden and a heated outdoor pool, Domaine De Malcor is located in Jarjayes. Pra-Loup is 41 km away. Free WiFi is available and free private parking is available on site. There is also a kitchenette, equipped with a microwave, toaster and fridge. A stovetop and kettle are also featured. Domaine de Malcor also includes a barbecue. You can participate in various activities, such as skiing, golfing and horse riding. Vars is 47 km from Domaine De Malcor. Hotel The Originals Gap Sud Le Cap is located in Tallard in the south Alps, 15 minutes drive from Gap city centre. It offers an outdoor swimming pool and a sauna and mountain views. Each guest room at Hotel The Originals Gap Sud Le Cap has a private terrace and panoramic views of the Alps.They are all equipped with flat-screen TVs with satellite channels and WiFi access. The hotel also has a restaurant, a lounge bar and a private garden. The property is located on Gap-Tallard airfield, where guests can fly in a glider or sky-dive. Charging stations for electric cars are available at this property. Set in Tallard, La Palissandre provides accommodation with free WiFi. There is also a kitchen in some of the units equipped with an oven and a microwave. Gap is 13 km from the apartment, while Orcières is 46 km away. Situated between mountains and vineyards, Le Mas d'Estello offers modern accommodations in a Provençal farmhouse. It features an outdoor swimming pool and an on-site restaurant serving refined Provençal cuisine. Gap-Tallard Aérodrome is 200 metres from the property. Rooms at Le Mas d'Estello offer modern furnishings with extra-large double beds. Each room is equipped with a flat-screen TV, minibar and electric kettle. Bathrooms have a shower, hairdryer and free toiletries. Breakfast is served daily for a supplement. Guests can enjoy dinner in the on-site restaurant and can relax with a drink in the outdoor bar and lounge area. Additional restaurants and grocery shops can be found 2.5 km away in Tallard centre. Tallard Castle is 2 km away and guests can visit perched villages in the area or visit Serre-Ponçon Lake, 20 km from the property. Gap Train Station is a 20-minute drive away and access to motorway A51 is 1 km from the property. Featuring a garden, an outdoor pool and mountain views, Au Paradis des Grillons is situated in Espinasses. Guests have a private terrace. The holiday home includes 1 bedroom, a kitchen with a dishwasher and an oven, as well as a coffee machine. A flat-screen TV with satellite channels is offered. The holiday home offers a barbecue. Skiing and hiking are possible within the area, and Au Paradis des Grillons offers ski storage space. Pra-Loup is 49 km from the accommodation, while Gap is 24 km from the property. Apartment Curbans Preferred hotel ! Set 20 km from Gap and in the heart of the Durance Valley, this proiperty features self-catering apartments next to Lake Curbans. BBQ facilities, an outdoor swimming pool and a tennis table are provided. With a private terrace featuring table and chairs, each apartment at Gîtes de la Condamine includes a living room with an LCD TV, CD player and a bathroom with a shower. A microwave, coffee maker and oven are available in the kitchen. A continental breakfast is served every morning and a bakery, grocery and tobacconist are 2 km from Gîtes de la Condamine. You can also use the hotel's free Wi-Fi before visiting the local restaurant, just 800 metres away. Rock climbing, via ferrata and paragliding can be done a 20-minute drive away and the Taillard Castle is 5 km away. Gap Train Station is 17 km away and Gap-Tallard Airfield is 4 km from this country house. Situated in Espinasses in the Provence-Alpes-Côte d'Azur Region, 50 km from Pra-Loup, Hotel De La Poste features a sun terrace and views of the mountains. Guests can enjoy the on-site restaurant. Each room includes a flat-screen TV. Rooms come with a private bathroom. A selection of activities are offered in the area, such as cycling and fishing. Vars is 70 km from Hotel De La Poste, while Gap is 24 km from the property. NESTOR HOTEL is ideally situated on the famous Route Napoleon in Gap, near the ski resorts and Ecrin National Park. It offers comfortable rooms, free Wi-Fi and free parking. This 2-star hotel combines comfort and charm with modern amenities such a satellite TV, Wi-Fi access, and private bathroom. A swimming pool and tennis courts are located 300m away and an 18 hole golf course is just a short drive. Guests can choose to start the day with the hotel’s buffet continental breakfast. At just 5 minutes from the Gap city centre, and less than an hour to the ski slopes, it’s a great location for exploring the local region. Première Classe Gap Sud - Micropolis is a hotel located 5 km from the centre of Gap. Serre-Ponçon Lake is a 30-minute drive away. Free WiFi access is available. Each air-conditioned guest room features a flat-screen TV. The private bathrooms have a bath or shower. Breakfast is available at the hotel, which is served in the dining room. Gap Bayard Golf Course is a 20-minute drive away. The property offers free parking. Avantici Hotel Gap is located in the south of Gap, 3 km from the city centre and at a 15-minute drive from Bayard Golf Course. It offers a 24-hour reception and a flowered garden with a terrace, where you can relax with a drink from the bar. The rooms at Avantici Hotel Gap are decorated in a modern style and include a flat-screen TV with Canal+, BEIN Sports and other satellite channels. Most rooms have a view of the garden. Each also has facilities for making tea and coffee and free WiFi access. The hotel’s breakfast made with local produce can be enjoyed either in the comfort of guest rooms, in the dining room or on the terrace, weather permitting. There is a drinks vending machine, a storage room, newspapers and a safe at the reception. Packed lunches can also be provided at an extra cost. Free private parking is offered at this hotel. Micropolis Technology Park is within 1 km and Tallard Aerodrome is 10 km from the property. Hotel Gap Preferred hotel ! Set at the foot of the Southern Alps, this hotel is located a 5-minute drive from the town of Gap. Free WiFi access is provided in the soundproofed guest rooms. A flat-screen TV is included in each modern room. The private bathrooms are fitted with a bathtub. A buffet breakfast is served every morning in the breakfast room at Best Western Hotel Gap. Guests can also dine out at the restaurant located just next to the hotel. Bayard Golf Club is 10 km from the hotel and private parking is free on site. There is a tennis court and a public swimming pool with water slides located just 300 metres away. Set in La Freissinouse, Holiday Home Route de Chaudefeuille features air-conditioned accommodation with a balcony and free WiFi. The accommodation is 4.2 km from Gap. The holiday home has 4 bedrooms, a TV with satellite channels and a fully equipped kitchen that provides guests with a dishwasher. The holiday home offers a barbecue. Orcières is 37 km from Holiday Home Route de Chaudefeuille, while Serres is 41 km away. Guest accommodation La Bâtie-Vieille Preferred hotel ! Offering free WiFi and mountain views, Les Gîtes de Galinettes is an accommodation located in La Bâtie-Vieille. Guests staying at this chalet have access to a fully equipped kitchen. The chalet has 3 bedrooms and 1 bathroom with free toiletries. A flat-screen TV with satellite channels and a DVD player are offered. Staff speak Belarusian and English at the reception. The chalet offers an outdoor pool. A children's playground is also available for guests at Les Gîtes de Galinettes. Gap is 9 km from the accommodation, while Orcières is 32 km from the property. Chez Samia is situated in Gap. The property has mountain and garden views. The apartment consists of 1 bedroom, a living room, a fully equipped kitchen with a microwave and a coffee machine, and 1 bathroom with a bath. A flat-screen TV is featured. The apartment offers a children's playground. Guests can go hiking or relax in the garden. Orcières is 34 km from Chez Samia, while Les Orres is 48 km away. Guest accommodation Curbans Preferred hotel ! Offering free WiFi and mountain views, Gîte Le Pigné is an accommodation set in Curbans. Guests staying at this holiday home have access to a fully equipped kitchen and a terrace. This holiday home with garden views has parquet floors, 1 bedroom and 1 bathroom with a shower and free toiletries. A flat-screen TV is offered. The holiday home offers a barbecue. Guests can also relax in the garden. Gap is 21 km from Gîte Le Pigné, while Serres is 38 km from the property. Situated on Route Napoleon and surrounded by ski areas, Mon Hotel à Gap is ideally located in the centre of Gap near the pedestrian streets and a 3-minute walk from the cathedral. It offers free Wi-Fi and parking for bicycles and motorcycles. Air-conditioned rooms feature a flat-screen TV with satellite channels. The private bathrooms are equipped with a bath tub or shower, hairdryer and free toiletries. All rooms have lift access. A continental breakfast buffet is available with local and regional products and freshly-squeezed orange juice. Restaurants and bars are located within a 5-minute walk from the hotel. The property is just 10 km from mountain passes Col du Manse and Col du Bayard, and 30 km from Col du Noyer. Gap Train Station is 1.5 km away and Grenoble Airport is a 2-hour drive away. The Italian border is about 100 km away. Public parking is available near the hotel. Located 500 metres from the city centre and from the train station, ibis Gap is a 24-hour reception hotel which features a regional restaurant, a bar and a terrace. Free Wi-Fi access is provided throughout. The air-conditioned rooms at ibis Gap have a satellite, flat-screen TV and a private bathroom with bath or shower. A buffet breakfast composed of sweet and savoury dishes such as eggs, fruit salad, yogurts and juices is served every day. Pastries baked on site and fresh French Madeleine cakes are also on offer, as well as a hot beverage and a piece of fruit to take away. Outside of regular breakfast hours guests can also enjoy a lighter option, available from 04:00. Other facilities are available such as luggage storage, newspapers and a safety deposit box is available at reception. Activities on site include playing tennis, 1 km from the hotel and you can also ice skate, 50 metres away. Serre-Ponçon Lake and Parc des Ecrins are 30 km away. Hotel Sigoyer Preferred hotel ! Located at the foothills of the famous Ceuze cliffs, the family-run Hotel Muret is housed in a traditional country inn and offers a calm and relaxing atmosphere. It features a cordial and family environment that plays host to 19 comfortable rooms equipped with modern en suite facilities and free Wi-Fi internet access. Enjoy traditional specialties and seasonal dishes in the hotel restaurant. Everything prepared in the hotel’s kitchen is made from the freshest regional products to reflect the delights of the mountains and Provence. For your relaxation, the Hotel Muret features an indoor swimming pool and a solarium. It also offers a sauna and a hammam, and guests can enjoy a massage (booking is required). Featuring a seasonal outdoor swimming pool and a garden, Villa à Gap offers accommodation in Gap with free WiFi and mountain views. This property offers access to a terrace. The holiday home features 4 bedrooms, a flat-screen TV and a fully equipped kitchen that provides guests with an oven, a microwave, a washing machine and a toaster. Orcières is 37 km from the holiday home, while Serres is 41 km from the property. Providing mountain views, Camping La Motte Flottante in La Freissinouse features accommodation and a private beach area. Free WiFi is provided. All units feature a TV, a private bathroom with shower and a fully equipped kitchen. A microwave and coffee machine are also offered. At the campsite you will find a restaurant serving French cuisine just 10 metres from the waterfront. Gap is 7 km from Camping La Motte Flottante, while Orcières is 31 km from the property. Situated opposite Gap Train Station, this hotel is decorated in a 50s diner style and offers free Wi-Fi internet access. Guests are invited to relax on the terrace, play billiard in the living room or have a drink at the snack bar. Hôtel Le Michelet offers colourful guest rooms with a flat-screen TV, a work desk and a telephone. The en suite bathrooms are fitted with a shower or a bathtub. Some rooms have a balcony or a terrace. A buffet-style breakfast is served every morning in the breakfast area. La Loco snack bar is also available for guests. Free covered parking is available on site for bicycles and motorcycles. Gap Cathedral is a 15-minute walk away and the property is 15 km from the A51 motorway and 22 km from Serre-Ponçon Lake. Hotel The Originals Gap Gapotel is located 1km from the Gap city centre, in the Provence-Alpes-Cote d’Azur region. It features a sunny terrace, along with modern rooms. The guest rooms at Hotel The Originals Gap Gapotel are equipped with private bathrooms as well as TVs with satellite channels. The hotel restaurant serves traditional cuisine and regional specialities, along with a buffet breakfast each morning. There is also a bar in the hotel. Additional facilities include a 24-hour reception and free private parking. 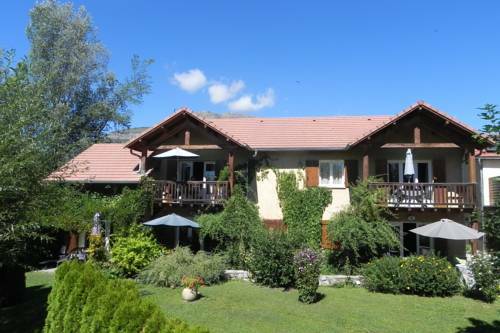 Set on a garden with mountain views, Masdani is located in Chorges just 12 km away from Gap and Serre-Ponçon Lake, and 7 km from Notre-Dame du Laus. Guests can enjoy the heated outdoor swimming pool in the summer months and free private parking on site. The rooms at Masdani offer free WiFi and views of the pool and garden. A private bathroom with a shower and a bathrobe, a flat-screen TV and an electric kettle are provided in the room. A welcome tray, including teas and coffee, is provided. Guests can access the Réallon, Crévoux, and Saint-Léger ski resorts just 20 minutes away and can enjoy windsurfing, water-skiing and kite surfing at Serre-Ponçon Lake. HotelF1 Gap is set in Gap and features a terrace. This 1-star hotel offers free WiFi. All rooms are equipped with a flat-screen TV with cable channels. With a shared bathroom, certain rooms at the hotel also feature a mountain view. Guests can purchase microfibre towels at the hotel at an extra cost of EUR 3 each. A buffet breakfast can be enjoyed at the property. Les Deux Alpes is 50 km from hotelF1 Gap, while Pra-Loup is 46 km from the property. Hôtel Restaurant Le Pavillon has a tennis court and a garden in Gap. Featuring room service, this property also provides guests with a restaurant. The property provides mountain views, a terrace, and free WiFi is available. All rooms in the hotel are equipped with a flat-screen TV. A continental breakfast can be enjoyed at the property. Hôtel Restaurant Le Pavillon offers an indoor pool. The area is popular for cycling and hiking. Orcières is 34 km from the accommodation. The Hotel Le Carina nestled in a large verdant park and features functional accommodation and a peaceful atmosphere in the Hautes-Alpes region, just 2 km from the city of Gap. Free WiFi is available throughout the property. The affordable and comfortable guestrooms are well furnished and equipped with modern en suite facilities. All rooms have cable TV and some rooms have been adapted for guests with disabilities. Guests can enjoy meals on the terrace in summer or in the dining room by the fireplace in winter. The restaurant serves traditional cuisine and specialises in sauerkraut dishes. Le Carina also provides guests with activities such as tennis, mini-golf, children’s playground and a covered, heated swimming pool. The Hotel Le Carina is the ideal place to discover Hautes-Alpes as you can take a free shuttle to and from the city centre from the hotel. This hotel set in a 6000m² park welcomes you in Gap for a successful stay between the city and the countryside. Entirely renovated, the Le Clos hotel features 29 peaceful and comfortable guest rooms fitted with satellite television. Most of them have also a balcony overlooking the park. The hotel’s restaurant will spoil you with traditional and regional cuisine and local produce of high quality. Meals are served in the warm atmosphere of the dinner room boasting fireplace or on the covered terrace. Gap boasts a wealth of treasures: walking, climbing, water sports, ski… there is something here for each and everyone. Offering free WiFi and mountain views, Studio indépendant dans villa avec piscine à Gap is an accommodation located in Gap. This apartment features accommodation with a terrace. The apartment features a kitchen with a dining area, 1 bathroom and a washing machine. A flat-screen TV is featured. Studio dans villa avec piscine offers an outdoor pool. Orcières is 33 km from the accommodation, while Les Orres is 48 km away. Hotel La Freissinouse Preferred hotel ! Situated at 1000m of height, near numerous outdoor sport activities (ski, white water sports, air sports, golf) the hotel welcomes you in a warm and rural frame. The bedrooms with modern conveniences (queen size beds) are at your disposal every day of the year. The bungalows benefit from hotel services. Take advantage pleasantly of the sweetness of the Mediterranean climate at the edge of our private swimming pool and be seduced by our 2 hectares park, the charm of its pond and its animals. Just 3 km from the centre of Gap, this ivy-covered hotel offers seasonal dishes made from local produce in its restaurant. It is a 20-minute drive to Ancelle Ski Resort and a 30-minute drive to Orcières Ski Resort. The rooms at Les Olivades are decorated in a contemporary style and provide an LCD TV. Each one is air-conditioned and also includes a minibar and facilities for making tea and coffee. The hotel’s continental breakfast is served in the breakfast room or in the comfort of guest rooms. After breakfast, you may choose to book a massage or a reflexology session. Free private parking is available on site and the A51 motorway is a 20-minute drive away. Other local attractions include Serre-Ponçon Lake, just 30 km from the property. A plug to recharge electric cars is available on site. Offering free WiFi and mountain views, appartement campagne quartier calme is accommodation set in Gap. The property offers free private parking. The country house features a flat-screen TV. The country house offers a barbecue. Guests can relax in the garden at the property. Les Deux Alpes is 116 km from appartement campagne quartier calme, while Pra-Loup is 74 km from the property. Guest accommodation Chorges Preferred hotel ! Offering a heated outdoor pool and a restaurant, Village Club Les Hyvans is located in Chorges on the shore of Serre-Ponçon Lake. Free WiFi access is available at the reception. The spacious rooms feature a flat-screen TV and a furnished balcony with either a lake or mountain view. The private bathrooms have a shower and hairdryer. A safe deposit box is included. At Village Club Les Hyvans you will find a tennis court and fitness centre. Other facilities offered at the property include a tour desk and luggage storage. There is also a beauty centre available for an extra fee. Entertainment can be enjoyed on site every day and night, and a bar is available for guests. In July and August, guests have free access to water sports including canoeing, paddling and windsurfing. Guests will also enjoy the outdoor restaurant with direct views of the lake, which offers buffet and grill options Gap is 25 km away and Embrun is 35 minutes’ drive from the hotel. The property offers free parking. Featuring accommodation with a private pool, mountain view and a terrace, Terres Clôt Du Jay is situated in Clamensane. It provides free WiFi and a seasonal outdoor swimming pool. The villa includes 2 bedrooms, a kitchenette with a microwave and a toaster, as well as a coffee machine. A flat-screen TV is featured. Horse riding and hiking can be enjoyed nearby. Gap is 45 km away from the villa. L'Ecrin du Lac is located in Chorges, in the Alps on the edge of Serre Ponçon Lake. It offers self-catering chalets and a seasonal outdoor pool. Guests can enjoy a private beach area and mountain views. Featuring a lake view, the accommodations will provide you with a TV, a living room with air conditioning, a kitchenette and a private bathroom with shower. The equipped kitchen includes a stovetop, dishwasher, micro-wave and coffee machine. Food can be enjoyed in the dining area or on the furnished outdoor terrace. With a terrace and lake views , the bar is open in July and August and serves snacks. Other facilities offered at the property include water sport facilities, a children's playground, a volleyball pitch, sports grounds, and a bar. An array of activities can be enjoyed in the surroundings, including cycling and hiking. There is also an entertainment program during the summer and children can go to the mini-club from Monday to Friday. The property offers free parking. Below here is the hotels map of Piégut. Names and details of Piégut hotels can be shown on the map clicking on the prices icons.